Epileptic events are more likely in certain states of stress or sleep depending on the type of epilepsy. These states are characterised by connectivity between brain regions that can be measured using techniques like EEG and functional MRI. Dr Carmichael has been studying the connectivity of the brain before epileptic events in patients with Juvenile Myoclonic Epilepsy (JME), and has found that in these patients activity in the brain areas that plan and control movement are locked together. The question is, if this high motor network connectivity is disrupted, can we alter the chance of epileptic events occurring? Transcranial electrical current stimulation (TES) is a cheap and safe method where small currents are generated in the brain which interact with brain activity using electrodes on the scalp. 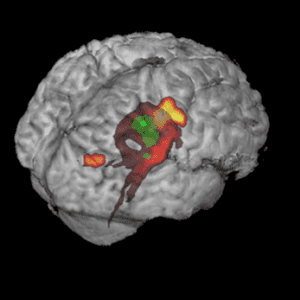 The project team have been using TES to alter brain connectivity and measure its effect using functional MRI. The researchers will bring together their new understanding of JME and use of TES to obtain preliminary evidence that they can normalise brain activity and prevent or interrupt seizures noninvasively in a well-defined syndrome. They will initially study patients that either have not received medication or have a poor response to medication and so have electrical discharges on EEG. They will test a number of conditions that alter the connectivity and excitability of the motor cortex while recording EEG to monitor the effects of the stimulation. Following this they will adjust the stimulation protocol if required and then scan ten patients with EEG-fMRI while undergoing TES. They can then measure the correspondence between any alterations in connectivity in the motor network and epileptic events. Electrical stimulation is currently used as a treatment for epilepsy however its efficacy has been limited in part because we don’t understand how to use it to modify an individual’s brain activity. We aim to demonstrate a non-invasive approach to measure the effect of electrical stimulation and provide preliminary data to show how it might be used to develop treatments.